Pasty makers from across the globe defied a week of extreme weather to descend on Cornwall’s Eden Project for the seventh annual World Pasty Championships yesterday, Saturday March 3rd. 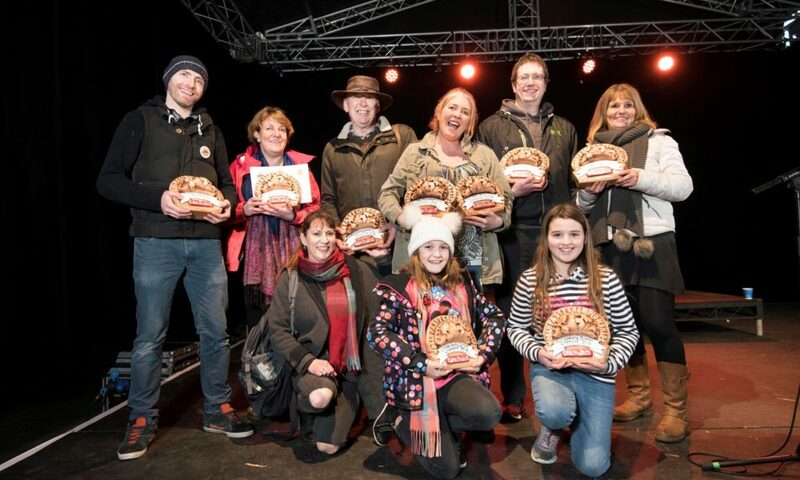 More than 200 pasties were entered into the competition, the highest number in the history of this grand celebration of Cornwall’s culinary gift to the world. The event formed a fitting finale to the first-ever Cornish Pasty Week. Mike and Jennifer were one of a number of contestants from North America, a contingent that also included 2017 Cornish Pasty Professional winner Gerry Ramier, from St. Catherine’s in Ontario, Canada, and 2016 Pasty Ambassador Matt Grant, from Ottawa, Canada, who travelled with his Canadian colleague Lauren Trick. Gillian Francis from St Cleer, near Liskeard in Cornwall, won the Cornish Pasty Amateur category and came third in the Open Savoury Amateur category despite only learning to crimp two weeks ago. The mum-of-three, who is a teaching assistant at St Cleer Primary School, said: “I’ve been testing out my pasties on my three sons for years but didn’t know how to crimp properly so I had to ask my next-door neighbour to teach me a few weeks ago. Proper Cornish won the coveted title of Cornish Pasty Champions for this year, pipping last year’s winners Cornish Premier Pasties at the post. As well as the pasty competition, the Championships always includes a fabulous day’s entertainment in the stage area. Britpop legends Dodgy, Cornwall-based 3 Daft Monkeys and legendary Redruth rappers Hedluv + Passman headed the music bill this year.